It is a storm that the high court of Kerala has kicked up recently when it observed why the government should consider banning toddy, a traditional beverage of the state, given the kind of spurious liquor that flows galore by its name. Can a drink be wiped off with the swish of a wand? Have we ever witch-hunted any other drink like this before? A pair of green eyes peers us through the darkness from across Europe. Age unknown. 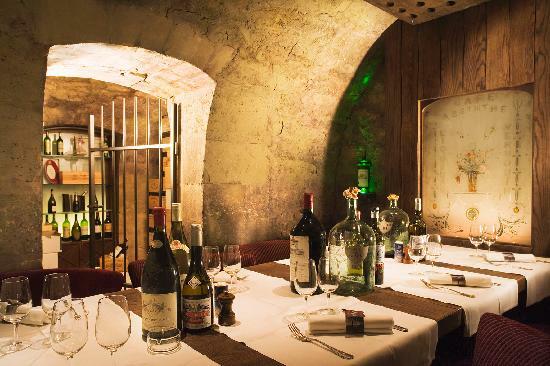 Made as medicine, lost in time, rediscovered in Switzerland, flourished in France, absinthe still can send a few chills down the spine of the continent as it did a century ago. 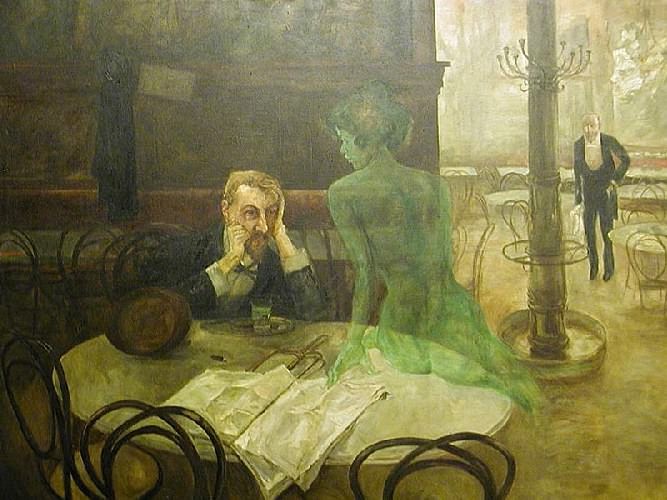 They were taught in schools that evil had a tone, green, that of absinthe. They sang against a green fire raging across the continent. By the turn of the 19th century, alcoholism was one huge pain in the neck of Europe and the US. Temperance movements, religious leaders, doctors and politicians cutting across political and national borders in Europe wanted to see the back of the devil. But devil it was, it stayed. Absinthe, with its Pied Piperean appeal over the masses, was Enemy No. 1. The anti-alcoholics wanted a ban to send the “bottled madness”, back to the wormwood, a plant, from which absinthe was distilled. In the French parliament, a critic screamed that the green drink was the “maximum of poison, condensed, refined, perfumed, irresistible”. Ugh! Absinthe! A glass of the shimmering green stuff on a table was, to many, the quintessence of anarchy, an arrogant denial of society and a cold shrug to family obligations. It creates madness, they said, but without believing themselves, until they got a much-awaited shot in the arm from a Swiss labourer named Jean Lanfray. One August morning in 1905, Lanfray poured himself two shots of absinthe, instructed his wife to wax his boots, and stormed out to work. When he returned in the evening, his shoes were still unpolished. In a fit of anger he took out his army rifle from the closet, aimed at his wife’s face and fired. She had a four-month-old foetus in her womb when she died. Rose, Lanfray’s four-year-old daughter who ran into the scene, hearing the noise, found the rifle pointed at her. She took the bullet on her chest. Lanfray stepped across her body. His two-year-old daughter, Blanche, was sleeping serenely in a crib in the next room, when her father pressed the fuming barrel on her. Lanfray found the rifle un wieldy when he tried to empty the last bullet on him. The injured man was taken to the hospital, and later to jail. “Un absinthiste [He drinks absinthe]!” screamed newspaper headlines. “Absinthe murder” became the hottest subject for newspapers in Europe for many days to come. The leading Swiss psychiatrist of the time, Dr Albert Maheim, drove the final nail by testifying that Lanfrey’s was a classic case of absinthe madness. Absinthe madness! That was curious, that got stuck. When the media finally cornered the drink for creating dangerous hallucinations in the minds of the drinker, few noticed the unnerving facts that were hastily swept under the carpet. Lanfray had taken those two shots of absinthe in the morning. Almost 10 hours had passed when he came back to the house in the evening. When he pulled the trigger, Lanfray’s muddy brain had long forgotten the absinthe it absorbed, but was reeling from many rounds of heady wine, brandy and an assortment of cocktails he had taken during the day. Who cared! A few days after Lanfray, another man coming from an absinthe binge finished his wife with a machete and a revolver. Absinthe’s trial was now complete. On July 5, 1908, the drink was voted out of Switzerland. Belgium had already banned it. France and the US were on the way. 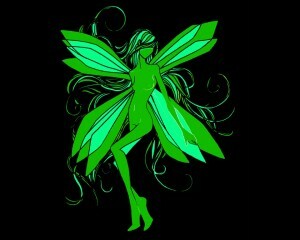 From everywhere, except Spain and England, the green fairy was exorcised. The evil genie was sent back to the bottle forever. Forever? Really! Absinthe was distilled from the herb Artemisia absinthium, known as wormwood. The Greeks used it as a medicine. In the mid-19th century the French troops who were fighting in Algeria finally returned home carrying a green potion they were given during the war. They had acquired a taste for the stuff. Once in Paris, absinthe spread like a virulent virus through the main arteries of Parisian high life, altering moods, freeing minds and firing up the imagination. When La Fee Verte, the Green Fairy, as absinthe was tenderly called, raged through the boulevards of France, with its mind-altering headiness, only a few could resist it. For a whole pantheon of young poets and artists of the 19th century who looked up to Paris for inspiration, absinthe became a muse, before which they must lay down their lives. They saw in absinthe the quintessence of the bohemian spirit; it could unlock hidden chambers within their creative minds. Soon, under its cool green shadow, the symbolist movement was born in cafes such as La Nouvelle-Athenes and L’Academie. Oscar Wilde and Ernest Hemingway waxed about it. Pablo Picasso sculpted it. Vincent van Gogh cut off his ear after drinking it. Rimbaud and Verlaine rode on its back to the extremes of wild imagination and eccentricity. In the early 19th century, 5 o’clock in the afternoon had another name in French: l’heure verte, The Green Hour. Hundreds of men and women of social standing thronged the cafes outside the boulevards to sip the emerald concoction that turned cloudy at the kiss of water, and watched life go by. Perhap s absinthe would never have won the hearts of millions had it not been for those quaint rituals and its cafe-friendly nature. It was not a thing to be drunk neat. The ritual began with a couple of sugar cubes perched on the top of a glass right over a perforated spoon. They would let cold water dripping from absinthe fountains set up in cafes fall over the sugar taking it down to the green liquid waiting at the bottom of the glass. The green liquid now turned cloudy. Sugar was used to cut the bitterness of the herbal liquor. But all sweetness turned sour when, at the beginning of the last century, absinthe was banned in country after country in Europe. Finally, it left the scene huffing and panting, much to the relief of temperance movements and also the powerful wine lobby that orchestrated the holy war against the green for its selfish gains. Absinthe was not born to die. It went underground to the hands of bootleggers and smugglers. Lookalikes flooded the markets, trying to cash in on the mystique of the drink that was now banned in Europe save a few countries. Absence makes the heart grow fonder. So was it with absinthe in its long period of hibernation. No drink in the history of alcohol has whipped up so much love and hatred like La Fee Verte, that it soon attained a mythic status by its very absence. For scientists, the drink has never stopped to baffle, as they try to pin down that one element in it that could have caused all the commotion at the turn of the 19th century. Is it simply thujone, one of the ingredients in wormwood? Or, is it the high alcohol content? Everything about the drink was unnerving, everything was strangely appealing. You can’t simply let such an enigmatic drink go down in history like that. A century had passed. In 2005 Switzerland lifted the ban. In Val-de-Travers where it was born, the illegal distillers found themselves being officially recognised. France followed suit. 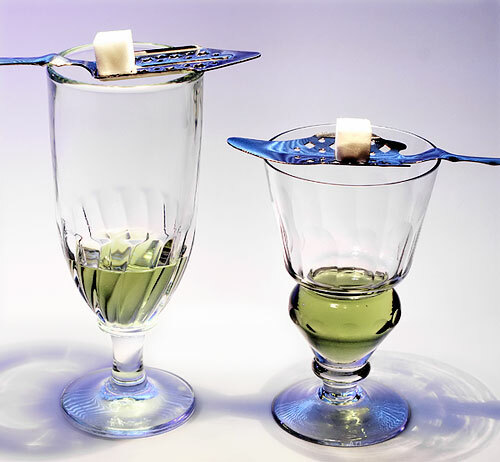 Absinthe has also made a big comeback in the US as well. The ban had only enhanced the mythical status of the drink: legends and fantastic stories grew over time around absinthe. Numerous distilleries are now working in Switzerland and France but they could hardly quench the growing thirst around the world for the green. 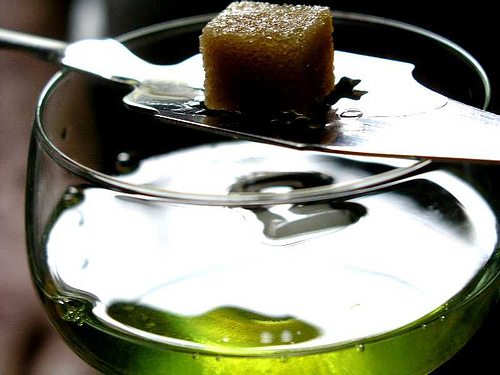 Absinthe is nearly 70% alcohol. Our toddy made from coconut trees is somewhere around 8%. If we ban the meek white drink it will never come alive again like the obstinate emerald drink of the West. Our toddy is not the stuff which legends are made of. No Van Gogh had cut his ear on it. No Rimbaud was shot at under its spell. No Verlaine had set fire to his wife’s hair in fits of white madness. No Picasso had fragmented a pot of toddy and a plate of tapioca into a puzzle of interlocking forms and multiple points of view. No country was ravaged by its white fire. If we ban toddy, this meek drink will fall like a soft plantain slit open by a machete. For toddy, La Fee Verte is a fantasy it sometimes moons over.